• Andrew Brownstein explains how EduHam uses the hit musical Hamiton to introduce students, particularly disadvantaged students to American revolution history. • are there other cultural phenomena that can be tapped as an entry point for education? • Learn more about Hamilton and education. 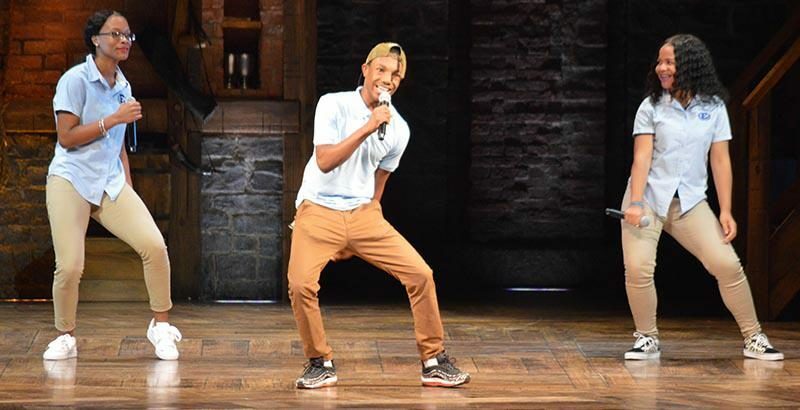 For two days in September more than 4,000 students from some of the poorest high schools in the nation’s capital witnessed a monument to Hamilton that may be as enduring as anything hewn in marble or granite: Hamilton, the musical. With the Revolutionary-era heroes played by actors of color, and scenes as arcane as the founding of a national bank told in epic rap battles, the Pulitzer-, Tony-, and Grammy-winning sensation about the “$10 Founding Father without a father” has given the life of Alexander Hamilton a new resonance. And for the students from area Title I schools, the September visit to the Kennedy Center was no mere field trip; the price of admission — in addition to $10, a symbolic Hamilton — was creating and performing an original work based on documents from the period. Hamilton creator Lin-Manuel Miranda said he first realized the educational potential of the musical years before the show opened, when he performed what became the opening number for a White House audience in 2009. Since the video of his rendition surfaced on YouTube, it has been shown in many Advanced Placement U.S. history classes. “I think teachers used just that one clip for the past six years as their intro to Hamilton,” Miranda told Newsweek in 2016. That’s when EduHam began. The goal was to immerse students in primary sources from the period, relying on Gilder Lehrman’s vast trove of more than 60,000 documents. These include a rare printed first draft of the Constitution and numerous letters from Washington, Jefferson, and more obscure Revolutionary-era figures such as Hercules Mulligan, the tailor who spied on British troops for the Continental army. Prior to performing, Bailey wanted students to mirror Miranda’s own writing process, including analysis of complex texts and creation of cogent arguments based on them. Read the full article about EduHam by Andrew Brownstein at The 74. If you are looking for more articles and resources for Poverty, take a look at these Giving Compass selections related to impact giving and Poverty. A good way to complement your interest in Arts and Culture is to connect with others. Check out these events, galas, conferences or volunteering opportunities related to Arts and Culture. Arts and Culture is an important topic. Other members found these Giving Funds, Charitable Organizations and Projects aggregated by Giving Compass to be relevant to individuals with a passion for Arts and Culture.